After a day off on Saturday, then another awesome day on Sunday (day 6, you can probably see by comparing the graph below with Day 5's graph), I had the sickest day today. 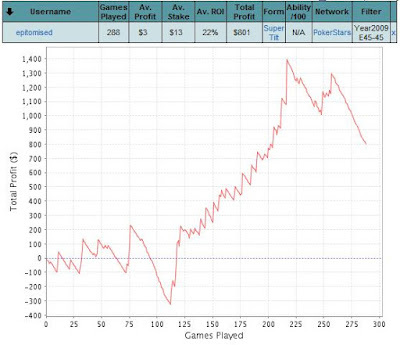 I played 29 45-man tournaments and did not cash in one. Not only that, I did not make a final table. Considering these things start off with only 6 tables, that's so bad. With my edge, you'd hope I'd hit at minimum of 6 in this sample. I didn't play any differently to how I had been doing up to now, I just didn't win any showdowns...literally. Whether the money went in ahead, even, or behind, I lost. I guess this was to make up for me running overly-good the last couple of days. Perhaps I need to evaluate whether I should play these during the daytime, it might be better to put in some late night sessions when there is more, and possibly worse, traffic. I'm not sure that made a whole lot of difference, but it's something I'll keep an eye on. I decided to take the rest of the day off after this gross session. I didn't want to start tilting, and tbh it seemed the only way to stop losing money was to stop playing. I guess I need to become accustomed to sessions like this, as they come hand in hand with MTTs. 0 Comment to "Running baaaaaadddd (MTT SNG Day 7)"
Some plonker has given me a column! £1000+90 DTD "The Main Event"